See more objects with the tag domestic interiors, hunting, curtain, furnishing fabric, palm trees, hunters. See more objects with the color saddlebrown gainsboro tan rosybrown sienna or see all the colors for this object. This is a Textile. It is dated 1913 and we acquired it in 1934. Its medium is linen and its technique is block printed on plain weave. It is a part of the Textiles department. Although best known as a painter, Raoul Dufy was also a skilled printer of woodcuts. 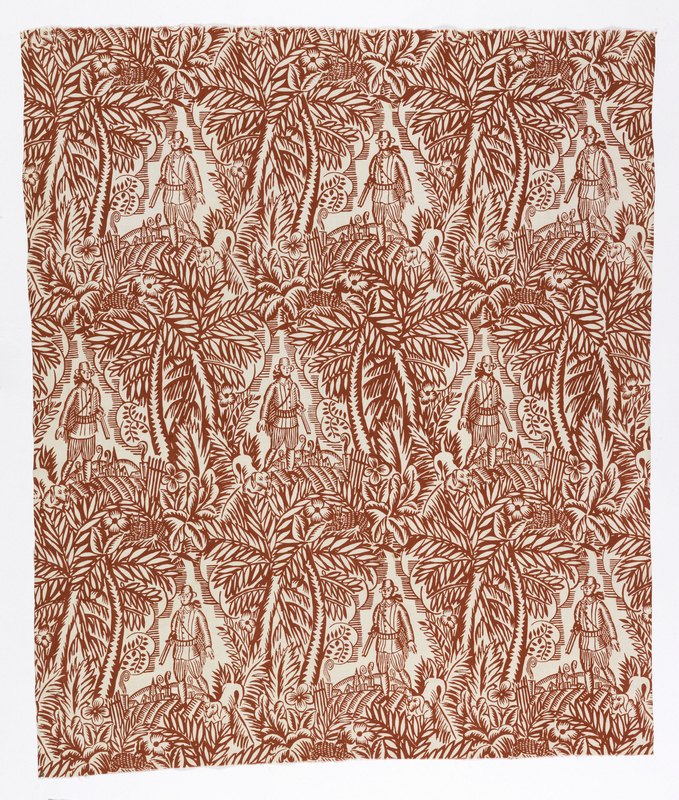 In 1910, with the encouragement of fashion designer Paul Poiret, he began translating his woodcuts into fabric designs. His reputation quickly grew, and in 1912 he signed a contract with Lyons-based silk weaving company Bianchini Férier to produce printing plates for furnishing and dress fabrics. The Hunter, featuring a huntsman against a bold foliate background with a hunting dog and a barely visible spotted deer, is one of a range of bold block printed designs known as Les Toiles de Tournon. It was wildly popular, printed from 1913 until at least 1955, and featuring in advertisements for the Tournon range beginning in 1925. An early example of the more than four hundred fabric designs Dufy produced over the course of his lifetime, The Hunter marks one of the first 20th century collaborations between a modern artist and a textile firm. 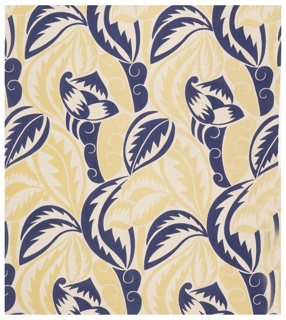 This object was featured in our Object of the Day series in a post titled Raoul Dufy: Painter as Textile Designer.